My dental hygenist introduced me to her new toy last week. ‘Are you alright with the water jet?’ she asked. ‘Try me,’ I said. ‘See how many times I jump.’ Though I said introduced, I have come across these things before and I remember not liking them very much. That was some time ago, and this time I managed to convince myself that last time a) it was a different hygenist in a different surgery, b) it was probably an older machine, and c) I was probably feeling particularly wimpish on that day. Five minutes later (I actually handled a whole five minutes of the thing), she had pulled me off the ceiling and reverted to the more traditional teeth-scraping techniques which, after the jet, felt remarkably gentle and painless. I have it on good authority that the water pressure at the tip of these plaque killers is over 6 bar (90 psi). This is around three times the pressure in a car tyre and more than the working pressure of Jennie’s boiler. I know that, because I was trainee fireman at Amerton for a few hours the other week. 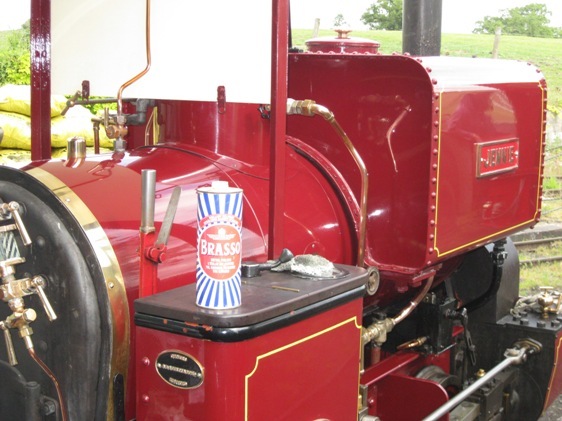 Note the size of the tin of Brasso. Now I remember why my arms hurt. If you think you are hard done-by then spare a thought for the long-dead drivers and firemen of this narrow gauge engine. It was built in Kilmarnock in 1923 for Edinburgh* gasworks. It had no cab and a short funnel because it was designed to be driven beneath the coke retorts so that red-hot coke could be dumped into the hopper wagons it pulled. I’m guessing the drivers and firemen didn’t live to see old age. If the smoke from the engine’s chimney didn’t get them, the gases from the hot coke did. Click on pic for larger. *I have just been reliably informed (as they say) that engine ‘Jack’ worked at the Provan Gasworks in Glasgow, not at Granton in Edinburgh.